Rope to the Hyper-Inflationalists, Which direction the silver and gold price? Up until the end of the prior recession to March 2003, the S&P500 was positively correlated to the dollar. 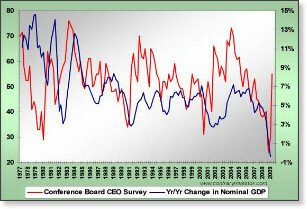 This correlation was rigged by central bank Gold sales to the aforementioned "banksters" while the masses were pre-occupied with dot.com. Since March 2003, the dollar and S&P500 inverted to opposing correlation. This opposing correlation is due to flight of dollars to the more productive, less indebted, developing world when exports are booming to positive consumer markets, and conversely the hoarding of dollars to service global dollar denominated debt when income and exports decrease (no de-coupling!). Correlation of Gold has been positively to the S&P500 and opposingly to the Dollar, but with the moves more amplified as percentage of price. The correlation has deviated within a month, but corrected itself within the next month or two. Unless the correlation between the S&P500 and the dollar ends, then the dollar must continue to fall or the top in the S&P500 is near. And Gold must go in the direction of the S&P500, give or take a month. The Gold correlation must persist until the value of world trade has shrunk drastically, i.e. continued hyper-deflation. Premature hyper-inflation would radically accelerate this shrinkage causing massive global shortages as the global economy would be reset to the smaller non-debt (Gold) economy. A controlled slow-burn down is seen to be preferrable (or at least not yet worth shedding blood to stop) by the masses at this time, but perhaps because they don't see the hidden costs. Governments can pull demand forward at the cost of lower demand later ("Cash for Clunkers", etc), and shift supply and demand so relatively higher prices in some things at the cost of much lower prices in other things, but this is not the same as inflation. China can buy up all the world's copper, the US government can buy up all the houses + old cars, even destroy them, but they can not create a global net increase in employment and prosperity via centrally managed mis-allocation (destruction) of capital. 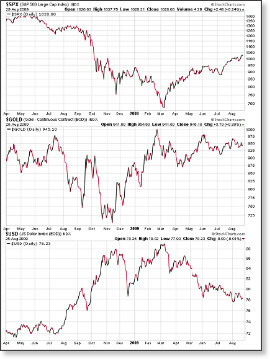 Gold was more correlated to the dollar in July/August 2008, as they telegraphed the big crash of the S&P500. 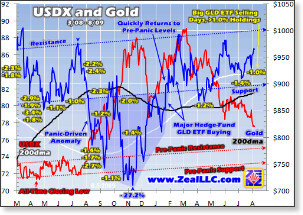 Then hedge funds leaving the stock market were buying Gold up in two counter-correlation thrusts, then Gold flatlined while the S&P500 and the dollar continued their correlation to bring Gold back in alignment. So far these counter-correlations have not been sustained. Perhaps the IMF gold sale was arranged to counter-act the threat of big players moving counter-trend. So there are two orthogonal questions, will the S&P500 go much higher and will Gold break correlation? Let's tackle the latter first. Gold to $3000 with skyrocketing Treasury rates would be the hyper-inflation end-game to shut-down the debt portion of the global economy. So that the world will eat from their hand after the wipe-out, the "banksters" want to first maximize the globalization of NPLs (non-performing loans). The formerly less-indebted, developing world is being forced to offset the hyper-deflation with massive mis-allocated debt ("stimulost"). Globalization is a process of spreading the banksters debt system into the hinterlands of every nook of the earth. For as long as the masses are not running to Gold, the banksters gain by continuing the hyper-deflation, i.e. 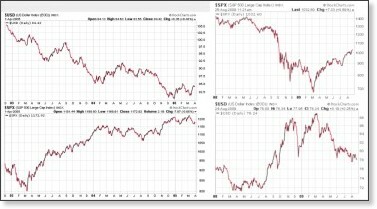 funnel the stock market stampede back into Treasuries. When the masses will break trend? In China, the political defense against rioting peasants, is to dump some "stimulost" on the burgeoning speculating middle-class. In the indebted first-world countries, it is reversed, dump "stimulost" on the burgeoning dependent peasant class, which is a political defense against the increasing vocally belligerent and dwindling middle-class. I see the catalyst as when the pain of the hyper-deflation causes the middle-class to physically fight and flight in droves. However, a court has ruled the Fed must reveal secrets, so it remains to be seen how the Fed can stall or redirect public attention (false flag event?). Will the S&P500 move higher, dragging up Gold out of the current sideways wedge, before (due to prior reasoning) the ultimate crash of both? The answer is murky, but I lean towards yes, because of the increasing Q3 corporate earnings on cost cutting in a jobless recovery, and leading indicators of the final positive lag effects of all the "stimulost" (while the negative lag effects build momentum). However, the sentiment index on the dollar was bouncing off all time lows recently, and the Euro rally appears to be peaking, so it is not clear how much more blood can be squeezed from the dollar, because of the apparently successful huge offerings of Treasuries. The Fed did huge foreign currency swaps, so these dollars are coming home into Treasuries, with the foreign currency sitting on Fed balance sheet. Thus the widepread sentiment that the dollar needs to drop to incentivize foreigners to buy Treasuries is misplaced given the purchase is rigged. Thus as usual, the herd is always wrong and dollar is probably near a near-term bottom, but maybe the herd hasn't figured this out yet so dollar can drop some more. As an early signal, remember Gold fell and the dollar rose before the S&P500 crashed in 2008. 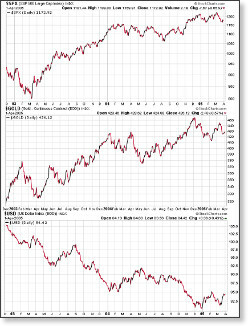 The recession bottom and recovery is stunningly identical in the chart patterns of 2002 and 2008-9. Thus, it appears the herd could be first given some rope to hang itself-- which I mean a further up move in the S&P500 and Gold, down in the dollar, only to reverse in violent stampede later. 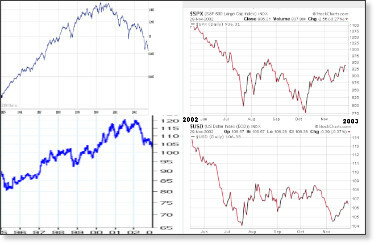 The reason is the divergence in the chart comparison of 2002 and 2008-9, noting there was a down-dip of the S&P500 from late 2002 to March 2003, before reversing into the multi-year rise. Whereas, now we appear to be getting the inverse, as a continued move up. The duration of the comparative periods for the S&P500 between 2002 and 2008-9 is roughly the same (7 vs. 9 months); whereas, for Gold the current period is nearly 3 times longer (7 vs. 20 months). My interpretation of this is that in 2002, there was continuation of the secular bull market (on nominal basis only with CPI lies), due to the aforementioned dollar shifting from positively to opposingly correlated to S&P500 by March 2003. The reduced central bank gold selling (and masses pre-occupied with "War on Tooth Fairy") allowed for a continued reflation. Whereas, the current period is a higher inertia (secular) shift to hyper-deflation, which can not support a multi-year rise in stocks-- only a choice for the banksters between hyper-deflation or hyper-inflation. Throwing some rope to the hyper-inflationists, then yanking it, is the likely choice. However, lower Gold prices creates higher bullion premiums and a negative gold basis, which will ultimately be the final warning of imminent hyper-inflation. In this game of musical chairs, the losers become slaves. 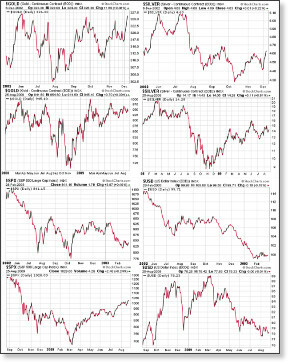 Note my article is saying that we are in a controlled crash (hyper-deflation), but there will be volatility (recoveries and crashes) in markets along this hyper-deflation path, and the end game is final implosion (of what every remains from the hyper-deflation) in hyper-inflation. It is key to click the links in the article to read my "Bell Curve Economics" research paper, which explains how the hyper-deflation can not lead to general inflation, irregardless of how much monetary base, supply, or stimulost is applied. Thanks to Nadeem Walayat for publishing my article. I am the author of this article, and I have below further explanation in response to an email inquiry about the article. I love this Comments section at marketoracle, as it allows me to annotate the article dynamically. I will try to keep this to a minimum, so as not to clutter any Comments others might want to make. Btw, I am not selling anything. I do not offer any subscription or anything like that. I desire to exchange ideas with the community. Correct I see that as most likely (and breakout might be significant), next most likely is stock market rolls over now and metals down with, and least likely scenario is we go into hyper-inflation (bank holidays, etc) now. > weaken, sending gold higher, but that has not been the case lately. The thesis of my article is that has not been the case since 2003, except for a few counter-trend thursts which revert to the trend. > back on the plunge. Yes I see that risk also. As well bullion premiums may skyrocket again. Thank you also for sharing your thoughts.